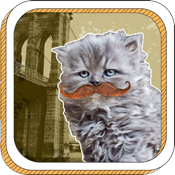 Welcome to Williamspurrrrg, a family-friendly, cooperative, multitouch puzzler where you outfit cats in mustaches, fedoras, bowties, and other hipster gear. To win the puzzles, hold all the pieces in place at the same time, creating finger-twisting awesomeness for kids and adults alike. Turn off multitasking gestures to enjoy the full range of multitouch-based puzzles. * Purrfect for hipsters, Brooklynites, cat-lovers, children, and anyone in between. * Fosters cooperative play for two or more players. Or, if you’re feeling clever and cunning, finger-ninja the puzzles alone. * Triggers hearty belly-laughs and hipster tendencies. * Irresistible and adorable photographs of cats and kittens plus hand-crafted cut-paper props, like mustaches and fedoras. There’s a fixed gear bicycle, too. * 60 puzzles with up to 10 simultaneous touches means double-jointed fingers may have an unfair advantage. * Causes dog-lovers to smile, no matter how much they say they dislike cats. * Original soundtrack, complete with cat choir, banjos, and epic win ditties. * No in-app purchases or third-party advertising. Founded by game designer Dr. Carla Fisher, No Crusts Interactive blends progressive educational philosophies and innovative game mechanics to create engaging interactive entertainment. You can reach us at info@NoCrusts.com or @NoCrusts on Twitter.